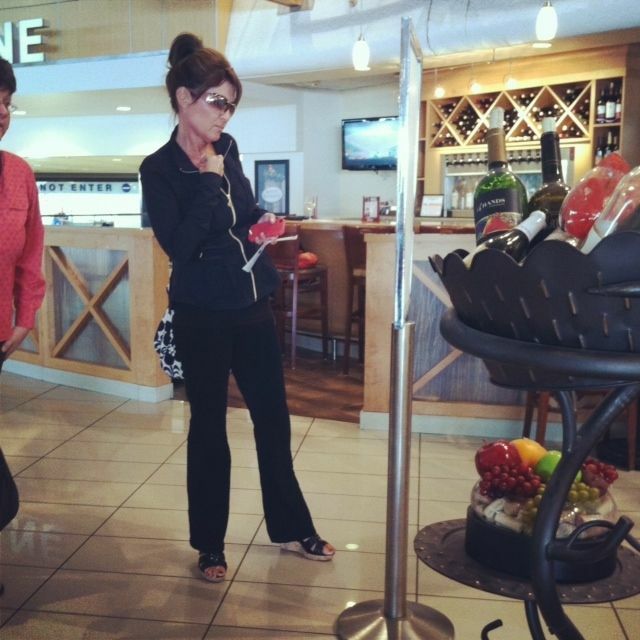 TheRustedChain - The Blog: Trust God and Sarah Palin. Trust God and Sarah Palin. Last week before I was to fly out to Spokane, I got scared. It seems that the older I get, the more of a hermit I become. I fought tears all day long before heading to the airport. I wasn't scared of the flight. I'm fine with planes. I was scared of the people. Sheer terror over having to face new people and talk with them. Like, near panic attack terror. I was angry at myself for even being such a wimp. I've always been painfully shy, but over the past few years that anxiety has really returned in full force. So at the last minute before heading to the airport, I made myself a bracelet, something I could look down at during the weekend when I needed a reminder. Be strong and courageous. I love that it's "commanded"... It's not "Haven't I suggested to you, be strong and courageous." It's commanded. That's an order! So the weekend went very well. Then Sunday I was in the airport preparing to fly home. I was looking at a restaurant menu. And I noticed the lady next to me looking too. I did a double take. Then I snuck my phone over and snapped her picture. Someone in the restaurant said something to her and she said, "Oh, okay!" I whispered to her, "Are you Sarah Palin?" So I introduced myself and we had a fun little chat, then went on our ways. A half hour later, we ran into each other again, laughed and talked some more. She asked me about my bracelets. I held up my wrist and said, "This one says 'So Long Status Quo'... It's a line from a Nichole Nordeman song. 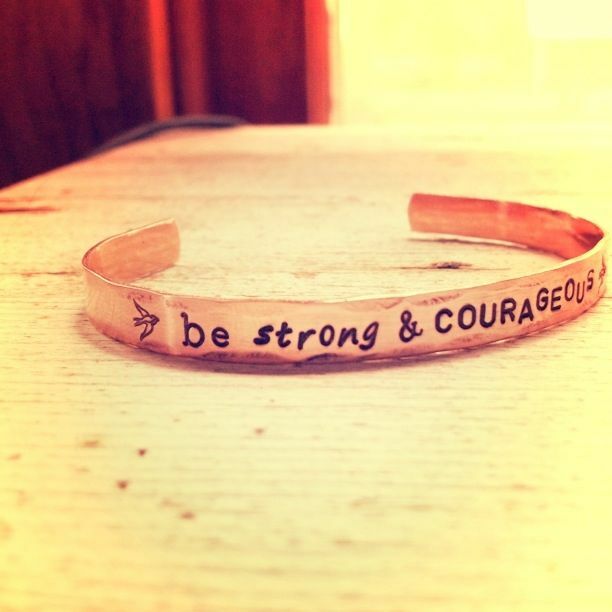 And this one says 'Be strong and courageous'". And I had this moment of God winking at me saying, "See?! I told you! Trust me." Now I know some of you aren't fans of hers. And that's okay. It's not about Sarah Palin. It could've been Hilary Clinton, Condoleeza Rice, Oprah, or anyone else. The fact was, God had allowed an opportunity for me to chat with a major news-maker with no fear. We talked like we were old friends. That panic attack anxiety when I was at home was gone. I was laughing and chatting and having a great time. Courageous. I know all about the hermit thing....Good for you!! You sound so much like me. I am such a shy wimp :-)))) Blogging/social media give me a voice and I can hide, it's GREAT! Fun that you met Sarah! Hermitting here too. Can't decide if I like it or not. How cool to meet Sarah and be able to approach her :-) You gave her one of your bracelets, right? Please tell me you did!! And I'm counting on the statement that leaving a comment will make me rich, beautiful and skinny...mostly the beautiful and skinny part~ha! I love that post! That is just like God to bring that opportunity to you! I love His Word and His faithfulness. Thanks, Beki!! That is great Beki! I was waiting for you to say you gave her your "Be strong" bracelet! You may just be getting an order from Alaska soon! very cool! I love when God does things like that, he doesn't have to, but He loves us so! How fun! I love it when God affirms out faithfulness. Great Job, Beki!